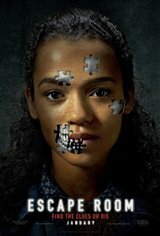 Escape Room manages that difficult trick of taking a group of boring characters with obvious overstated purposes in a seen it before plot line with a highly predictable resolution AND somehow create suspense and tension. An exciting Fahrenheit 451 beginning. Is almost immediately undercut by a protracted adventure in a marina like winter world. And in an almost no that we’ve lost your attention effort the rest of the movie becomes Less about discovering and more about getting throug it so that the movie can let us know we have been set up in an escape room from the get go. Attempting to surprise us with a twist the movie begins anew telling us the story it really wants to tell about greed and powerlessness and conspiracy. And it is here we learn that no one ever escapes as we are set up to return to the theatre for escape room 2. The second floor or some other I’ll aptly named sequel. We are pawns in corporate greed attempting to trap us in yet another mediocre horror franchise. Don’t buy the ticket. The ending was also AMAZING IT WAS LEGIT! Btw I’m the same person if the review from the one before this one. This movie was AMAZING the acting is great but my fav character died which is kinda sad, I’m extremely young but I have seen more horror movies than anyone in my family, and this is one of my favs. Two words off brand and predictable. The whole story and concept is like the replica of the movie Jigsaw except this one is less extreme and non-brutal. Not boring but pretty intense, I enjoyed this movie!